My social media life began in November 2007 with creation of a Blogger web log. Since then, it expanded, notably with joining Facebook on March 20, 2008. But now, the bloom is off the rose, and I’m not sure what future, if any, social media holds for me. 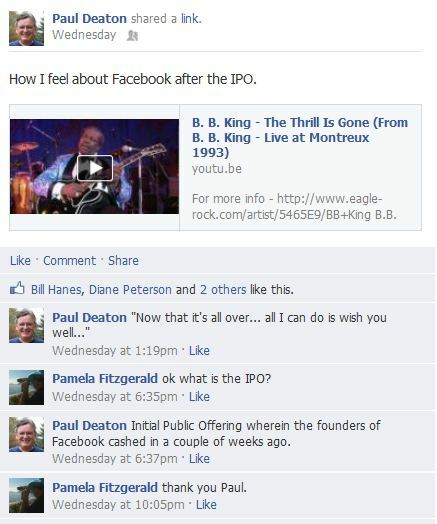 This was coming for a while, but the Facebook initial public offering on May 17 was the high water mark. Wrapped up in a political campaign, it became clear how little social media matters in local politics, and how despite the recommendations of party elders to use Facebook, twitter and YouTube, our social discourse has not migrated from in person to the Internet. It couldn’t have been clearer during the run up to the June 5 election. Social media serves us well by enabling us to gather information about people, places and things in a timely manner. If we like, we can share it with others. If there is a big story in the news, it rapidly appears on twitter and we can stay ahead of the news curve. There is little reason to turn on a television any longer, and mostly, we don’t in our household, except to watch a specific program, for background noise, or to view a DVD. Information exchange is the primary value of social media and that remains important. At the same time, social media appears to fail when it comes to position advocacy and community organizing. What brought Condoleezza Rice to support the New START Treaty, as she did toward the end of 2010? Be assured, it was not social media. In stopping HF 561, the nuclear power finance bill the last two years, posting about it on Facebook didn’t appear to be a primary motivator for people to oppose the bill and contact their elected officials. Social media is more like preaching to the choir. It was countless community conversations that explained what the bill meant and why it was bad for Iowa that made the difference. One might invite someone to an event using social media, but the lion’s share of work was done in person and on the telephone. Any advocacy strategy that uses social media as its primary tactics seems bound to fail. ~ This is the third of a series of posts based upon writing in my journal. This entry was posted in Social Commentary and tagged sustainability, Writing. Bookmark the permalink.